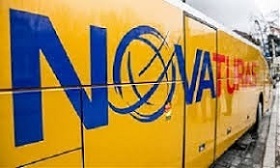 Novaturas, one of the largest tour operators in the Baltic states, posted 28.8 mln euros in revenue in January-March of this year, up 12% from the same period last year, reported LETA/BNS. In March alone, the company's turnover inched up 2% to 9.8 mln euros, it said via the Nasdaq Vilnius stock exchange. And from the beginning of this year, the company has served 41,100 clients, an increase of 9 % y-o-y. Central European Tour Operator owns 47.4 % of Novaturas, Ugnius Radvila controls 9.49 % and Rytis Sumakaris and Vidas Paliunas owns 6.86%. Its shares are quoted on the Vilnius and Warsaw stock exchanges.